I’m still updating this post as more information comes in and as I understand more of what’s in the BICEP2 paper and data. 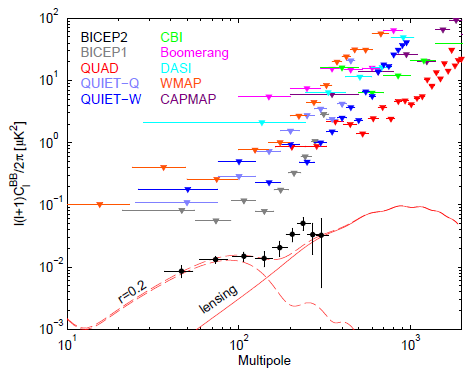 Here’s BICEP2’s data! The black dots at the bottom of this figure, showing evidence of B-mode polarization both at small scales (“Multipole” >> 100, where it is due to gravitational lensing of E-mode polarization) and at large scales (“Multipole” << 100, where it is potentially due to gravitational waves from a period of cosmic inflation preceding the Hot Big Bang.) All the other dots on the figure are from other experiments, including the original BICEP, which only put upper bounds on how big the B-mode polarization could be. So all the rest of the points are previous non-detections.